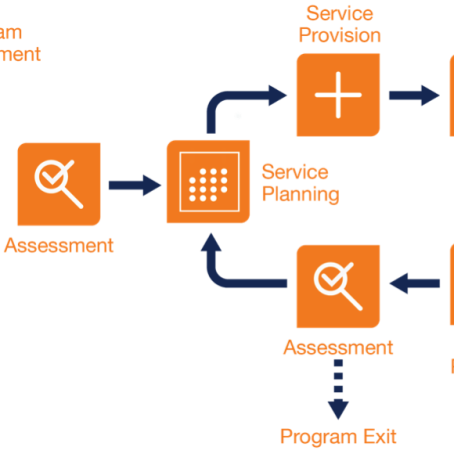 For many clients who are enrolling in multiple programs offered by a Human Services agency, the following scenario might be all too familiar. Meet Susan—a single mother who wants to register for a training program that will make her more employable. After filling out a lengthy form by hand, Susan meets with one of the agency’s employees who asks questions to supplement the information provided. Fast forward three weeks when Susan finds herself evicted from her current rental. She returns to the agency to find out if she is eligible to explore low-income housing services. Susan completes another form—one that is almost identical to the one she completed weeks ago, with the exception of a few extra questions. She then meets a new employee who asks that same questions that were posed during her previous visit. The pain of this process is palpable on the agency side as well. John has been working at the agency for almost a decade, during which time new programs have been added, but not much has changed with the client intake process. After a client fills out the required paperwork, John asks follow-up questions to fill in the blanks that the client skipped, and then the intake form is added to the client’s paper file, which is kept in the program’s department. When the client enters another program, the process is repeated; another paper file is created and housed elsewhere. More paperwork. More files. More data silos. The result is not only a time-consuming process for everyone involved, but also limited visibility into the big picture of the client and the agency. Fast-forward to reporting time, when John’s manager asks him for a report that details the number of clients that the agency has served over the past year. And so it begins: the counting, the manual entry of data into an Excel spreadsheet, the removal of duplicates to get accurate numbers. John spends many hours on these tasks—hours that he would rather spend helping clients. The entire process is not only painful and time-consuming, but it is also ripe for human error. Susan’s and John’s experiences are common place among Human Services agencies, especially ones that have under-invested in technology for various reasons–internal funding challenges, resistance to change, lack of internal capacity or alignment. However, the tides are turning, largely due to increasing pressure from funders, changes in legislation, and the need to do more with less by streamlining processes. An opportunity to make it easier for a client to gain access to your programs. An opportunity to streamline the intake process for staff. An opportunity to simplify the report creation process. An opportunity to spend more time helping people instead of pushing papers. These opportunities can be seized when an agency implements a universal intake form—a distilled version of multiple intake forms across the agency’s programs—that is accessible to staff whenever they have internet access. The online form allows for rapid data capture of the client’s basic demographic information, as well as other information that is pertinent across programs, and then stores the data in the different places where it belongs (e.g., contact record, case record, referral, assessment, and/or household). Your agency’s universal intake form can be supplemented by additional program-specific forms. By having all of a client’s data housed in one system, your agency gains a complete view of the client and avoids the creation of duplicative information. So, what does a universal intake form mean for clients and staff? Clients: With universal intake, clients like Susan who use multiple programs within your agency will have a superior enrollment experience—one that is smooth and efficient. Staff: For employees like John, their jobs will get a lot better, as they can quickly access key data online. They no longer have to gather information from colleagues and paper files, and then enter and manipulate data in a spreadsheet. The time saved can be used to provide more services to a larger number of clients. Organizationally, an online universal intake form is a game changer in terms of identifying trends and promoting the right programs to the right clients at the right time. Your nonprofit will gain agency-wide reporting capabilities, giving your organization more data and better data, which can translate to improved service delivery and greater impact. Want to see universal intake in action? Register for an upcoming webinar where we will demonstrate the universal intake process using Exponent Case Management (ECM).